Yay Members! Appreciation Night — Yay Bikes! 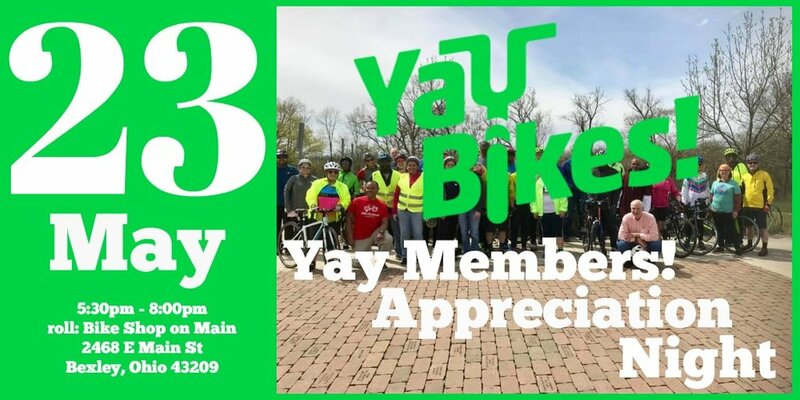 Yay Bikes Members! Save the date and roll by May 23 starting at 5:30pm at roll: Bike Shop on Main 2468 E Main St, Bexley 43209. Find out what we have been up to and what we have planned for the year, plus eat, drink and be merry! RSVPs appreciated. Thank you for your support of peaceful streets that all can enjoy! Not a member? Need to renew?